I looked at that pic this morning and thought that the person designing the top didn’t communicate with the person designing the bottom. And it doesn’t have the mark of Omar the Tent Maker, so how they ever thought to put one-size-fits-all is beyond me. Incongruity is generally not good in fashion. This dress looks like the seamstress grabbed from the wrong pile of fabric to add the skirt. And the one-size-fits-all is probably a marketing ploy to get this mutation out of the stock room as fast as possible! 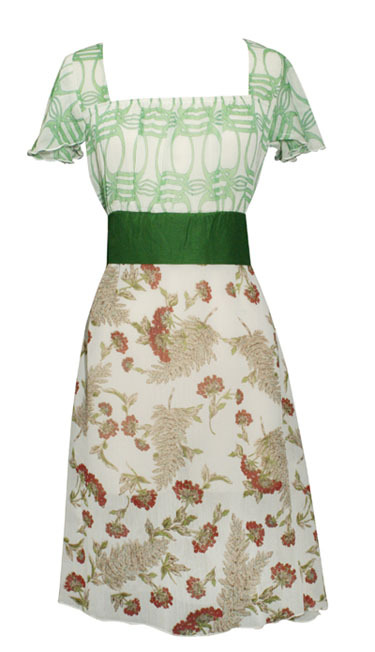 The next one-size-fits-all “bargain” will probably be the brown floral top with the green print skirt. To me it looks like a fitting muslin made of leftover fabrics. But no, they wern’t, the fitter used the wrong, expensive fabric samples, and now they have to sell the darned thing to get some of their money back. Oh, dear. Yeah, I’m not keen on that mix either. But I’ll readily admit to being perhaps overly conservative in that area.And one size fits all is the world’s greatest idiocy. who actually believes in the “one size fits all” myth? Especially in a dress that looks as if it depends on fit to actually look decent. Argh. I think that dress is bum-ugly. I’m surprised you passed up this one! This one doesn’t *say* one size fits all – actually, it gives no size info! And is it just me, or do all their clothes look like someone just slapped them on the mannequin? Case in point. Maybe someone was trying to pose and they forgot they were cutting out the body…?? Meanwhile, off-topic, but have you seen Irtroit’s latest dress sketch, and the photo of her in the actual dress?Midriff band: check!Plaid: check!Cute as a button: check!Seen any patterns like that? This looks like the kind of thing I used to make from scraps for my Barbie doll when I was six. I think the top is supposed to be the trellis for the flowers below. I agree, that waistband looks very badly made. Perhaps the ‘one size fits most’ means the dress was designed by the same company that makes hospital gowns, and has ties at the back (memory flash of Jack Nicholson in Something’s Gotta Give). I think the green is a sash that is extra long to tie in the back and stuff in any extra material, making it one size fits all. :p This dress was obviously sewn while someone was drunk. maybe the one-size business is because it is totally open at the back? Hospital gown? Maybe apron? !What ever it is, it’s a good idea gone very bad. I like the idea that someone made this one up while drunk! bbrug: Irtoit’s dress is soooo lovely! I like the fabric on the top half of the dress that’s it. I dont like anything else. It makes perfect sense once you realize that the parent phrase is actually, “One size, fits all like crap.”They’re just using part of the phrase; that’s why it’s so confusing.